"I want to do a loss less 4k trim of a mp4 file but my editor only gives me a mkv file. I want the output to be a mp4 file. my editing program doesn't accept mkv." In this article, we’d like to help you quickly solve the issue and enable you to trim 4K MP4 and keep original format in a lossless way. This software works as one of the best 4K video trimmer. You can chop off the end or start of the video, or both, to cut a clip from the middle of video. The tool will try to keep the same quality and format for cut video and audio as the original file. It excels in its cut feature especially. It can trim any 4K files including 4K MP4 preciously. 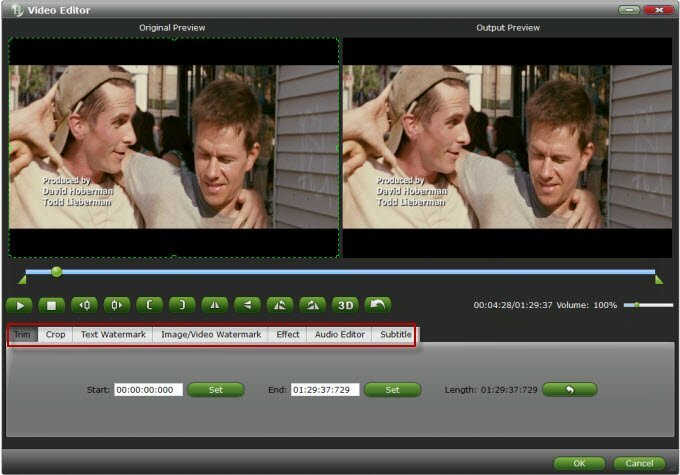 Besides, this software also supports other advanced edits like add subtitles(See how to add subtitles to MP4), add effects, crop, replace or remove audio(See how to remove audio from MP4). Once you’ve downloaded and installed our software, start cutting your 4K MP4 files now. 1. Run Brorsoft Video Converter. Click Add button to load 4K .mp4 video you need to edit. 2. Click Edit button to cut your 4K MP4. If you want to cut off the beginning or ending part of the video, you can move the Playback Indicator to the desired position and the click the OK button to confirm. 3. This program has many export options that you can use to save the edited files. Since you wanna keep MP4 format as original, just choose H.264 MP4 from Common Video. 4. Finally, hit Convert button to begin 4K video trimming. After that, we can get the desired result. Okay. It’s the whole process for a Lossless 4K trim of a MP4 file. Enjoy.